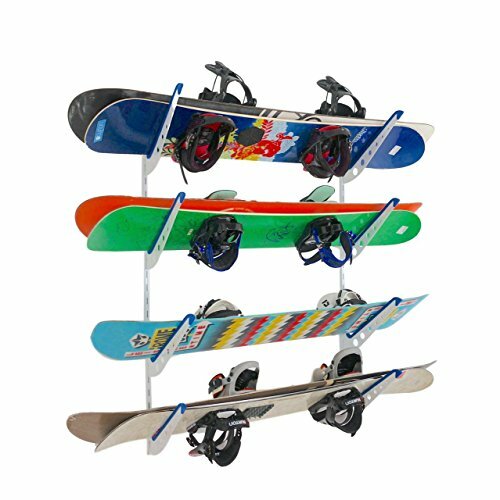 Made by StoreYourBoard, the leaders in outdoor sports gear storage, this Snowboard Rack is an adjustable wall storage solution for all your snowboards at home! The Rack consists of 2 wall tracks and 4 sets of rack brackets. The rack arms can be inserted in the tracks at whatever setup you need to accommodate your snowboards and skis. Space your rack levels apart to custom fit your setup boards and boots. What Snowboards Will it Hold? Made of steel, this Snowboard Storage Rack can hold most all snowboards on the market, including widths and lengths. Space the tracks apart on your wall to fit the length of all your snowboards. Mounting this rack to your wall is quick and easy. Simply insert 4 screws through each track into your wall's studs, then insert the rack arms and you're ready to store your snowboards. A quick hammer tap to the top of each rack arm inserts the arm firmly in place. All the hardware you need to install the rack is included. This rack holds more than snowboards! Use it to store your skis, surfboards, wakeboards, skateboards, and anything else you've got in your garage (tools, fishing rods, beach chairs, etc.). HEAVY DUTY STEEL. This snowboard holder is strong enough for single or double snowboards on each level, 4-8 total snowboards. EASY SETUP AND INSTALL. Sets up in minutes with 4 screws through each track, then simply insert arms and store your snowboards. MULTI-PURPOSE. Stores snowboards, skis, surfboards, wakeboards, skateboards, tools, and more.